BALTIMORE, MARYLAND - August 29, 2013 - Can't wait for September 7th to roll around for your first day at the Baltimore Comic-Con? Then good news! 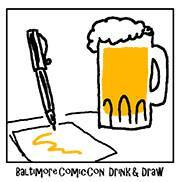 The Baltimore Comic-Con Drink & Draw to benefit Team Cul de Sac and the Michael J. Fox Foundation will be taking place from 6pm-8pm on September 6th, 2013 at the Pratte Street Ale House, 206 W. Pratt St. Baltimore, MD 21201 - across from the Baltimore Convention Center! Join artists, cartoonists, and fans for FREE food, great beers, original art, rare collectibles, and door prizes! Gather with artists and attendees to have a great time and benefit a great cause. 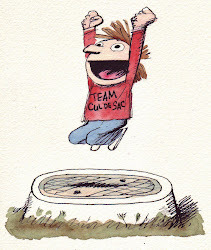 Team Cul de Sac (TCDS) is a TEAMFOX fundraising effort initiated by Chris Sparks in honor of his friend Richard Thompson, the cartoonist behind the Cul de Sac comic strip who was recently diagnosed with Parkinson's disease. The Michael J. Fox Foundation is dedicated to finding a cure for Parkinson's disease through an aggressively funded research agenda and to ensuring the development of improved therapies for those living with Parkinson's today. TCDS asked cartoonists across the world to contribute artwork to a fundraising book and auction to raise additional money. Hundreds responded and sent artwork in, the result of which was Team Cul de Sac: Cartoonists Draw the Line at Parkinson's published by Andrews McMeel. The book is a multiple 2013 Harvey Award nominee, and Chris Sparks received the Bob Clampett Humanitarian Award at the 2013 Eisner Awards for his efforts towards the book and the charity. September 6th, 2013 - from 6-8 PM Interested in donating art? Need more information? Contact Joe Sutliff at joe@joesutliff.com or check our event's Facebook page for details!